When company is expected, most people tidy up around the house—they vacuum, straighten the books on the shelf, replace burned out lights, maybe even clean the bathroom. God forbid someone should come and actually see how we live every day. After they arrive, we throw a steak on the barbeque, lock the dog in the backyard so he doesn’t jump on the guest, and take out our best china and stemware. Hopefully, the guest enjoys himself, and if there are any imperfections in our hospitality and not everything is as perfect as June Cleaver might like in the faultless world of TV sitcoms, the guest is nice enough not to say anything. If the guest is really special, he might climb the stairs and visit with grandpa, who is too infirm to come to the living room. What does a country do when a visitor is expected and that visitor is the Pope? This past week we got to see how it works in Cuba. 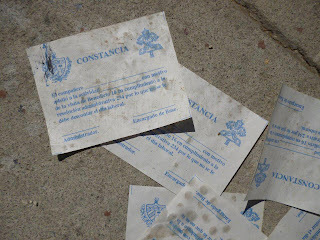 The dissidents and the followers of Santería, all of whom were anxious to spend some time with the Pope, were, like the dog, kept out of sight and in the backyard. The large Havana public square, La Plaza de la Revolución was draped with bunting, blocking out the large sign that reads “motherland or death.” Papal flags were everywhere, together with Papal drinking water bottles. Although only ten percent of the population regards itself as Catholic after more than thirty years as an officially atheistic state that ended in the 90s, hundreds of thousand came to the square to watch the Pope celebrate mass. Afterwards, instead of going upstairs to visit grandpa, he drove over to Miramar to chat with Fidel. Oh to be a fly on that wall! The papal visit has confused many Cubans. Although some have been enjoying the freedom to go to church that was granted in the aftermath of the first papal visit of Pope John Paul II, and others were forced to attend for fear of being docked a day’s work, the vast majority of the population does not attend church services. Due to the poor state of the economy, the national leadership has been encouraging the workers to work harder and sacrifice for the national good. Now, not only were they given a day off from work with full pay to go hear the Pope speak, but they also have to understand how it is that the government leadership has now made Good Friday a paid national holiday, in response to the Pope’s request to Raul Castro. None of the dissidents spoke to the Pope, and aside from an admonishment he made before he arrived in Cuba that Marxism is a failed policy, the Pope refrained from criticizing anyone in the Cleaver household. He did mention the next door neighbor disapprovingly, however, when he asked the U.S. to end the Cuban embargo. The pope behaved himself, and he’ll probably be welcomed back some day. I wonder what holy day will become a holiday at that time. On March 26, 2012 a Cuban man was violently beaten and arrested during the mass held by Pope Benedict the XVI during his visit to CUBA. Cuban government thugs dressed in RED CROSS logo uniforms beat him with a stretcher over the head. He was dragged away for shouting "down with communism" and "Cubans are not FREE!" As of today his physical address is totally unknown. We ask the help of all international and human rights organizations in protecting this protestor. He is at risk of losing his life in a Cuban prison. Furthermore, his disappearance will be used by the Cuban government as an example to demonstrate what happens if one violates the government control of speech. A fearful and silent population allows the government to sustain itself. When the Pope landed in Santiago de Cuba, Raúl was there to greet him, but instead of kissing his ring (too religious?) he shook his hand and bowed gently. No confirmation of any meeting with the impatient patient, as Chávez undergoes radiation therapy in a Havana clinic. Meanwhile, there have been more than 170 dissidents in several cities of Cuba who have been detained and warned that they will be "dissappeared" after the Pope leaves Cuba according to babalú.com. Included in this number are several of the Women in White. Adjusting this number to the population of the U.S., this would be the equivalent of detaining 4,837 people in our country. Wednesday's mass at the Plaza de la Revolucion promises to bring several hundred thousand to hear the Pope. It will be interesting to see if he uses the opportunity to speak about the need for greater freedom. I can’t believe it—more than a week without posting! Shows what switching desktop computers from Windows to an iMac will do. Also, it did not help that I had a four plus day jury trial to conduct. The judge in that case made an interesting observation—95 percent of all jury trials worldwide are held in the United States. There is something very ennobling to watch twelve citizen jurors decide how a case should come out. It’s not a perfect system, but it does ensure that the people have a say in how the judicial branch is run. Sadly, Cuba and its neighbor Venezuela don’t come close to this guaranty of the preservation of the rights of the people. In the intervening time since I last wrote, Chavez has left Cuba, but last night announced he is going back for further medical care. The Pope is finishing his visit to Mexico and is about to visit Cuba. The presence of the Pope and the impatient patient in Havana at the same time presents a conundrum for the Pope. Does he meet with Chávez in an effort to further protect the Church in socialist Venezuela and thereby give credibility to Chávez in the October 7 elections? Before being stricken with cancer, Chávez had no need for religion and held the Catholic hierarchy in Venezuela in contempt. Now faced with his own mortality, he suddenly has found a place for “socialist Catholicism.” It is impossible to conceive that the Pope would meet with Chávez without also devoting significant time to visit with the Cuban dissidents. Six hours ago Venezuelan journalist @nelsonbocaranda reported that the Pope accepted the impatient patient’s petition for a private audience. Where does that leave the Cuban dissidents? The dissidents I wrote of, a week ago Thursday, were removed by the security police at the request of the Cardinal, who appears to be altogether too close to the government and not willing to give offense. It will be interesting to see how the Pope treats the dissidents. The New York Times called for the Pope to lobby Raúl to gain the release of Alan Gross. Gross has lost a hundred pounds and is suffering from both diabetes and arthritis. His mother has cancer. The Cuban who had served time for spying and is on probation in the U.S. has a mother who has cancer, too. Given the proximity of Passover and Easter, there is an opportunity for the Pope to broker a deal. I hope he does not let this chance slip by. In a post that appeared today in Translating Cuba, Mario Hechavarria Driggs reports about the occupation of a church in Havana by the Republican Party of Cuba (not to be confused with Gingrich, Romney, et al). Thirteen protestors have taken over the church making demands for increased liberties in Cuba. Predictably, the church officials threatened the protestors that if they did not leave, the police would be called. The story reminded me of the attitude of the position of many in the Roman Catholic Church during the Batista regime. The hero of my novel, Pedro Villanueva is a priest at the oldest church in Cuba, La Iglesia del Espíritu Santo. He is constrained by the church hierarchy from taking any action that might be deemed favorable to the revolution being led by Fidel and Raul Castro. Father Pedro is distraught by the corruption and violence of the Batista regime, but finds no support from the senior priests from the archdiocese. History is repeating itself as protestors put their personal freedom on the line to demonstrate for greater freedoms for everyone in Cuba. Shortly, the Pope will visit the island. I wonder what he may say to Raúl Castro behind closed doors. Below you will find Mario Hechavarria Driggs’s report. It is taken from http://translatingcuba.com/?p=16516. Protests in La Iglesia de la Caridad. Members of the Republican Party of Cuba (PRC) and the November 30 Movement, remain entrenched from the afternoon of Tuesday 13, at the Shrine of Our Lady of Charity, located in the Havana municipality of Centro Habana. The Chancellor of the Church, Monsignor Jose Ramon Suarez Polcari and the pastor of the Church of Our Lady of Charity, priest Roberto Betancourt, met with the opposition to ask them to leave the church, but they refused. In the evening, State Security cut the phone connection and maintains a cordon around the sanctuary, a police crackdown on the protesters is feared. Is Havana the Capital of Cuba or Venezuela? The Answer Seems To Be Both! I am often asked why I write about Venezuela when my blog is about Cuba. It’s a reasonable question. When I wrote the initial postings, I thought the blog would be only concerned with Cuba, the locale of virtually my entire novel (Caracas is mentioned only in passing as a safe haven). Because I have read the news from Cuba and the blogs of dissidents who bravely write from there, I have observed that Venezuela’s affiliation to Cuba helps explain much of what is happening in Cuba. I have come to the conclusion that one cannot begin to understand current-day Cuba, without also attempting to understand current events in Venezuela. The two countries have become so closely aligned that it is difficult to distinguish between the foreign and domestic policies of each country. The loss of the Soviet Union as a sponsor for its feeble economy had propelled Cuba into the welcoming arms of Hugo Chávez, who has returned the affection by idolizing the Cuban state and its leaders. When the Castro government lost its support from the Soviet Union, its economy lost is sole source of financial stability. Enter Chávez, who supplies Cuba with oil in exchange for technical assistance in the form of teachers, doctors and other university trained professionals. Cuba then exports the oil on the world market. Chávez regards Cuba as a revolutionary democracy, not a dictatorship, and has publicly stated that Venezuela is “traveling on the same sea” as the Cuban people, a sea of happiness and of real social justice and peace.” Many Venezuelan government agencies are staffed with Cubans, and when Venezuelans are in need of specialized medical care, they come to Cuba by the tens of thousands. Chávez’s recent cancer surgery is but the most prominent of such medical tourism visits. By his inaction of not appointing the Executive Vice President to act, Chávez has demonstrated that he believes that his presence in Havana does not constitute a temporary unavailability, i.e. Havana is Caracas is Havana. 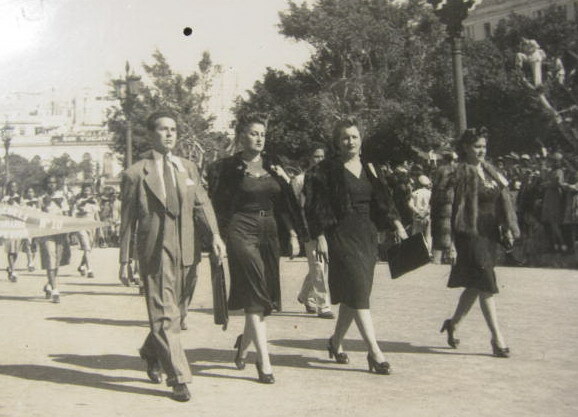 One of the main characters of The Death of the White Rose is a woman in her mid-thirties, who is the chief of the auditing section of the Cuban IRS, El Tribunal de Cuentas during Batista’s regime. While one of the top three people in her department, she worked secretly in the underground supporting Fidel, believing in his promise to return Cuba to democracy under the 1940 constitution. She is a strong woman, who is a single parent with three children. She lives in a middle-class neighborhood in Havana with her mother and children and manages to succeed in her career while actively supplying the rebels in the Sierra Maestra. In many ways, this 1959 protagonist would have been quite at ease with the feminist movement that changed the lives of women in the U.S. in the 70s and 80s and was typical of many women who worked and raised families in the Cuba of the 1950s. In a posting in TRANSLATINGCUBA.COM, blogger Rebeca Monzo recalls the life of her grandmother and mother in Havana of the 1950s. Her recollections of her family’s matriarchs caught my attention. These real people lived lives parallel to that of my fictional heroine. 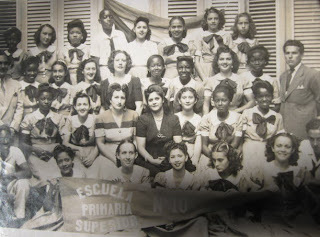 The photo of her school class reminded me of my heroine’s children’s schooling in Havana. Note the uniforms of the children and the educator wearing a business suit. Pictured is a public school class, not a Catholic school. The students are well dressed and all wearing uniforms. What is lost in much that has been written about Cuba prior to Fidel is that there was a substantial middle class in Cuba that enjoyed lives similar to the population of post-war United States. 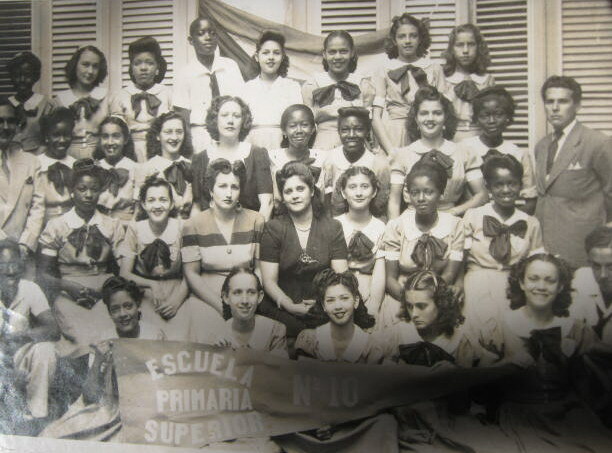 In many respects, the women of Cuba were more socially advanced that their sisters in the U.S.
Cuban women were in the vanguard among the first in liberating themselves in Latin America. I was born into a matriarchy: All my family were teachers and pedagogues or, like my grandmother, a court clerk. My mom was very young when she graduated and began working immediately. First in rural schools and after accumulating experience, in the city. She was widowed when my sister and I were still girls. She remarried years later and divorced where her marriage had lost its reason for being. We always did fine thanks to her work and she was a wonderful mother and a very worthy woman. In Cuba at that time women were working, studying, voting, earning college degrees, driving cars and even smoking. Some, like my aunt, were active in politics. This was never a reason to abandon their husbands and children. Everyone’s lives were governed by schedules that were respected. There were also many facilities that allowed women to work outside the home: food could be ordered, as could products from the drug store, by telephone and delivered to the home. The buses ran on time and frequently, there were laundries, dry cleaners and many other services that eased the chores. That was the normal course of development, which was abruptly interrupted in the year fifty-nine. Now, we, their heirs, are “liberated” and what we have achieved it to make our lives a mathematical equation: They multiplied our challenges and tasks, they subtracted the pay, and even divided the family. And so, on March 8 I want to congratulate all the emancipated and liberated women and above all those who, despite everything, have been able to maintain regular and close ties with their families. 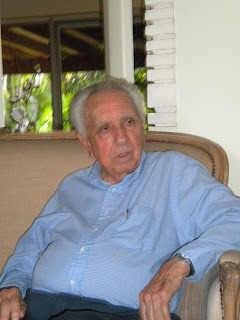 While browsing through the archives of Translating Cuba, I came across an interview of Juan Almeida with Silito Tabernilla, a general who served during the Batista regime and who accompanied Batista out of Cuba on December 31, 1959. The departure of Batista and the rise of Fidel Castro is the historical backdrop to The Death of the White Rose. In researching the history of the times prior to writing my novel, I had not run across some of the views expressed in this interview. I cannot vouch for the accuracy of the recollections of Silito Tabernilla, more than 50 years after the events he describes. It makes me wonder, assuming the story is true, how different the world of Cuba would have been, if Batista had gotten out of the way of his generals and allowed them to suppress Castro. The suggestion that the American government protected Fidel from the beginning makes no sense to me, and is not a theory that I have read about elsewhere. Certainly, in 1959 the American government attempted, on numerous occasions, to persuade Batista to step down, and that was tantamount to support of Fidel at the very end of the Batista regime. That he eventually left occurred because of the political realities he faced domestically, not because the Eisenhower/Kennedy administrations forced his hand. But this is the first time I have read that the American government supported Fidel in February, 1957 when Herbert Matthews, who is referred to in the posting below, interviewed Fidel Castro for the New York Times. It is possible that the general misinterpreted the zealousness of an American reporter for the activities of the American government. I recall reading that Batista doubted that Fidel had in fact spoken to the reporter. Batista continued to deny that the interview had taken place, insisting that Fidel had been killed during the Granma landing. It was a lie he continued to perpetrate, claiming that if the interview had occurred the New York Times would have published a photograph of their reporter with Fidel. Finally, the Times published the photos, and Batista’s minions tried to cut out the photo from the paper before it could be distributed. JJ: There are men who unwittingly become part of history. That is the case with General Tabernilla. ST: I was born in beautiful Guanabacoa, son. I lived there a year and a half, then we moved to La Cabaña where my father belonged. I kept living in Guanabacoa, I never left. My uncle Marcelo, my father’s brother lived there. There were three brothers: Francisco, Carlos and Marcelo. JJ: When did you join the military? ST: I told you that when I was a year old or so we moved to La Cabaña from Guanabacoa. From early childhood I lived among soldiers. I am a soldier by birth and by calling, but I officially entered military life in 1937, the same year my wife was born. My brothers became pilots, but aviation didn’t do anything for me. I didn’t like taking a plane to go from here to there. If they gave me an order I’d do it, but I don’t like to fly. Even here, every time they invite me I say no …. JJ: What do you remember about that last flight, when you left Cuba? ST: Well, it was a long process. The American ambassador told Fulgencio Batista that he should leave Cuba and that the United States would not recognize the government of Rivero Agüero. Batista accepted, but if he had acted like a President, people would have supported him, and the military also, although many soldiers were disgusted because every time they presented well-thought-out plans to finish off Fidel, Batista rejected them. It was unbelievable how he defended Fidel. Of course, Batista was not a soldier, neither by career nor mind-set.He was in the army as a sergeant stenographer. On December 2, 1956, the telegram came about the landing of Fidel Castro and a group of around 100 men. We found out even before the landing, and we could have acted. By then I was head of the infantry division in the military town. At 11:00 I asked the CIM for Batista, and they informed me that he was eating at the home of Dr. Garcia Monte. I went there, and when I arrived they were playing canasta –the Admiral, Rivero Aguero, Garcia Monte, some others and Batista. He stared at me. I talked to him about the landing and our lack of reaction. He asked me for discretion, he said: “Silito, let’s talk about this later, I don’t want Martica (his wife) getting nervous.” After a while he got up and asked for a map. They brought him one from the Esso gas station. He opened it and immediately asked where the landing had been. He knew nothing about it. He proposed sending 40 men. It was totally crazy, but he believed he was invincible. JJ: Invincible, like any dictator…. Look, he had no idea about what it means to be a soldier. Then they sent a battalion under the command of Juan Gonzalez. In Alegria de Pio Captain Morelos Bravo had made contact with those we called “the rebels” in a sugarcane field that was on fire. I’ve never seen a cane field burning, it must be horrible. ST: Impressive. There were casualties on both sides. Our troops regrouped to organize the final offensive, but General Robaina arrived with instructions from the President and ordered a return to Havana. Leaving that situation in the hands of the rural guard was another tremendous insanity. Commander Juan Gonzalez was insubordinate and was punished for it. One can say that Fidel Castro arrived in the Sierra Maestra because Batista let him win. And there were many times that Batista spared Fidel’s life; all those decisions were taken in my office at Columbia, in the military town. Any effective action would have ended that war, but this one extended it, it finished nothing, and the troops were eager to stop and return. Batista had delusions of being democratic, pretending to be something he wasn’t, and because of that he was never photographed with any solider. Then came the campaign of Herbert Matthews. First he interviewed Fidel Castro in the Sierra Maestra and then Batista in the palace. The publicity from that meeting, a little manipulated, had a significant effect, especially on the businessmen. General Cantillo was named chief of operations and prepared a perfect plan to kill Fidel, but the same problems that set Batista against his own military led him to conspire. That was a process which, in private, ended with the Americans taking part in the affair. On November 1958 Mr. Powell met with Batista. After that meeting Batista himself told me “Listen, Silito, when that guy called me, I wanted to give them a kick.” Things were getting complicated, the elections were approaching, and the Americans began to intervene openly in favor of Fidel Castro. This was something incredible that we could talk about for hours. They even took away our weapons, and we had to buy them in the Dominican Republic. When the American ambassador told Batista that he must leave Cuba and that they would not recognize the government of Rivero Agüero, Batista agreed. I was in the military town, it was about 5:30 in the evening, calm, when my phone rang and it was Fulgencio Batista asking for Cantillo. I called the Air Force and they answered that Cantillo was flying from Santiago de Cuba and would land in Columbia in about an hour. I told Batista, and he said that when the plane landed, to order Cantillo to meet him at his house at 8:30 pm. It was Cantillo’s wedding anniversary, so they met at 10:30, not at 8:30 as previously ordered. When I got to Kuquine, there were several people. Cantillo arrived at 10:30, and they enclosed themselves in the office for 10 or 15 minutes. When I returned to Columbia, I went with the order to deliver the division under my command to General Cantillo (he who has the division has control of Columbia). I had sent for the top officers. We did the transfer of power. Here I have it saved as a historical document of my immediate resignation. There Cantillo informs us that the president has decided to resign to avoid bloodshed. Some were happy thinking about the end of the war. Others were sad, envisioning perhaps that there would be a much longer and worse war. I returned to the residence and Batista was eating. When he finished, he told the duty officer to let us come in. We generals entered, and Captain Martinez picked up the charts and the operations dispatches in the room. The planes were ready; our route was to fly to Daytona Beach. Batista’s fate would be decided during the flight itself. The last thing I remember about Cuba is that I got on a plane, and with the same gun I had when I rode into Columbia, I landed in Jacksonville. JJ: And tell me, General, have you thought about returning? ST: Yes, absolutely yes, I’ve thought about returning. It’s what every Cuban yearns for. A. 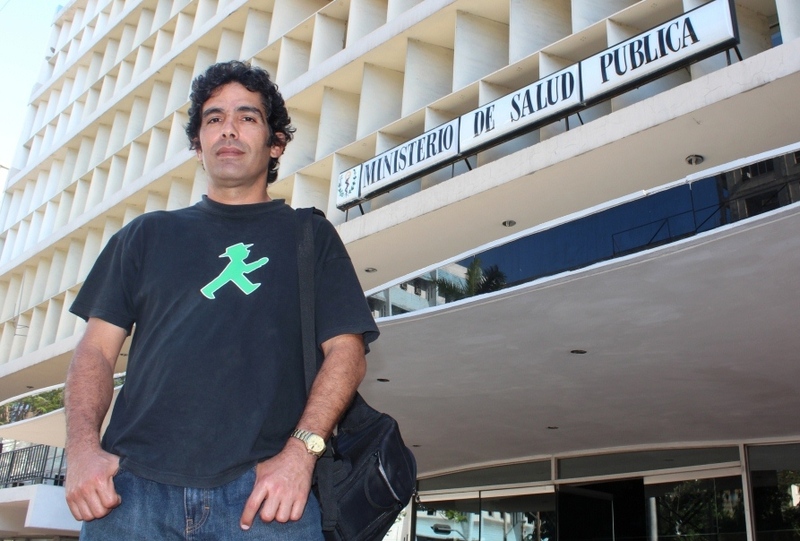 – The repeal of Ministerial Resolutions 248 and 249 of 27 September 2006, that disqualified for the practice of medicine in Cuba for an indefinite period and this writer and my colleague Dr. Rodolfo Martinez Vigoa. 2. – The repeal of Resolution 14-06 of April 25, 2006, which arbitrarily suspended my Residency in Internal Medicine when I was in my final year. 3. – That Dr. Alfredo Felipe Valdes, Cuban citizen in exile in Malaga, Spain, will be given his college degree duly approved by the Ministry of Foreign Affairs of Cuba, as agreed between the governments of Cuba and Spain in late 2010 on Spain’s welcoming of political refugees from [the Black Spring of] 2003, a commitment unmet to date. I declare a hunger strike in full possession of my mental faculties, in good health and without any associated organic condition that might cause my death for the next three or four months, so the responsibility rests with the Ministry of Public Health, the Communist Party of Cuba and the Cuban government for my death and for all consequences arising from this action that I take after exhausting all resources that I as an ordinary citizen had at my disposal. This is a decision I assume exercising individual sovereignty which I have over my own life as an adult and aware of the step I am taking, so no third person can be accused of instigating me to undertake this conduct. The hunger strike will realize physically in Marti Park of the Artemisa municipality of Guanajay, in front of the Community Polyclinic, which was my last workplace. I will only retire from that place if I am arrested by the police or the bodies of the State Security. To be communicated through the blog Citizen Zero, Twitter and through +5358200251. In my novel, La Rosa Blanca is the name of a sail boat that is skippered by the protagonist, Father Pedro Villanueva. No ropa vieja on the menu, but they serve a wonderful Margarita and chile relleno. The place was packed, thanks to a new Groupon promotion ($25 worth of food for $10). We decided not to use our coupon, since it did not apply to drinks and saved it for another day. I asked the owner why her restaurant was named La Rosa Blanca, wondering if it had anything to do with the Marti poem that is the leitmotif of my novel. She cast my literary illusions aside with the simple truth that it was the name of the place when she bought it twenty-five years ago and couldn’t afford to change it at the time. I told her of the significance that the name held for me and for Cuba. She nodded appreciatively, but knew of no connection to the Marti poem, "I Cultivate a White Rose." While the experience was metaphorically disappointing, the food was delicious and I can’t wait to go back. Looks a great place for a kick-off party when the novel is published. You’re all invited! CHAVEZ SAYS HE "SOARS LIKE A CONDOR." THE WORDS HAVE THE SMELL OF DEATH. The news from the impatient patient, upon awakening from the anesthesia after his operation, broke to the world in a tweet that he supposedly authored. According to his tweet, he is “soaring like a condor” and is in good health. Of course, it is impossible to know if it was actually Chávez who wrote this simile. But, accepting it as his own verbage that he chose to describe his recovery from surgery, it is curious to me that he chose this particular image to compare himself to—the condor. One thing that differentiates the condor from other birds is that it lacks a backbone. Its flying muscles are therefore not firmly anchored and the bird does very limited flapping of its wings, and instead, it tends to soar on air thermals, rising on hot air. And like a vulture, it feeds on the bodies of the dead. Chávez chose the image with which to describe himself. I wonder if subconsciously he chose it to describe what he has done to Venezuela, rising on the rhetoric of eight-hour long speeches (like his mentor Fidel) and feeding on carcasses of those whose property he has expropriated (also like Fidel). The October election is an opportunity for the Venezuelan people to change the bird that leads it. Perhaps it would do better with a hummingbird at the helm. At least it can flap its wings and not depend upon death to feed itself. And unlike the condor Chávez, it would decorate the landscape with its beauty—the hallmark of human rights.